The Biddenham Loop has been the scene of human activity from the Palaeolithic through to the present-day but the majority of the archaeological evidence spans the Neolithic to the early 4th century AD. Apart from two handaxes, probably brought up from deep within the gravel by recent quarrying, no evidence for Palaeolithic activity was recovered. Given that the Biddenham area once had a reputation as a prolific source of material of this date, its absence is explained by the development’s relatively limited impact on the underlying gravel terrace. Field artefact collection provided valuable information on the location of late Mesolithic/early Neolithic and late Neolithic/early Bronze Age occupation. During the earlier period, activity was concentrated along the edge of the river terrace. In contrast, the late Neolithic/early Bronze Age flint concentrations were far more widespread, extending into the interior of the Loop. No direct connection between this change and the tree-throw holes recorded in the excavation areas could be demonstrated but it is clear that extensive tree clearance must have taken place at this time. A small number of probable Neolithic monuments, including rectangular and oval enclosures, were identified. Dating and function remain uncertain because the evidence for them derives mainly from non-intrusive survey. The high density of late Neolithic/early Bronze Age monuments, including thirty ring ditches, is suggestive of a ‘monument complex’, several of which have been identified along the Great Ouse. The ring ditches occurred in clusters, each in the vicinity of at least one Neolithic monument, suggesting a degree of continuity. One ring ditch actually truncated a probable Neolithic shaft. In addition to the monuments, some of which may have been associated with funerary practices, cremation burials were found in flat graves. In terms of location, the monuments (identified as cropmarks, geophysical anomalies and excavated features) and ‘settlement’ areas (identified by flint concentrations) were mutually exclusive. Where excavation was undertaken below flint concentrations, few sub-surface features were identified; it is presumed that the only evidence for ‘settlement’ survived in the ploughsoil. Elsewhere, where ‘settlement’ evidence was found, it comprised individual, or clustered, small pits. 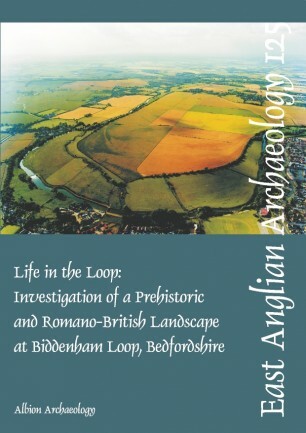 Although the nature of any ‘settlement’ prior to the late Bronze Age is uncertain, thereafter the Biddenham Loop was continuously occupied until the end of the Romano-British period. This longevity of settlement must be due in part to local topography: a riverine location with adjacent land just above the flood plain. Any settlement would have been well positioned to exploit a range of natural resources. The main area of late Bronze Age-early Iron Age settlement was unenclosed and quite extensive. It contained several concentrations of features including small pits, water pits and post-built structures. Although limited, the evidence suggests that the settlement was permanent and that mixed agriculture was practised. At this time, the first physical land division, in the form of a pit alignment, was constructed within the Biddenham Loop. This has the appearance of a single boundary, designed to ‘cut off’ the southern two thirds of the area enclosed by the river’s meander. However, traces of a second pit alignment have been identified to the south, closer to the river, suggesting that a more complex series of boundaries may await discovery. Six unenclosed, early-middle Iron Age farmsteads were identified, all sharing similar topographical locations adjacent to but above the floodplain. Two were close to the earlier settlement, possibly suggesting some degree of continuity. The key identifying characteristic of each farmstead was the presence of a concentration of large storage pits. However, one also contained evidence for roundhouses and enclosures; another was associated with an inhumation burial. Such pits have traditionally been interpreted as seed grain stores, but sufficient evidence was recovered to suggest that mixed farming continued to be practised. 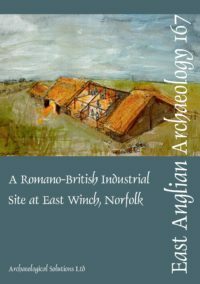 All four late Iron Age/early Romano-British farmsteads were close to, but not in exactly the same location as, their predecessors. They were more extensive, although usually only comprised one ditched enclosure. Both cremation, including a cemetery, and inhumation burials occurred on the periphery of the settlement areas. Away from the farmsteads there was evidence for dispersed and isolated activity, including field systems, short-term occupation and a possible shrine. The latter is interesting because of its isolated position, some distance from the nearest farmstead. The four farmsteads continued to be occupied into the late 1st century AD, although they were augmented by extensive rectilinear systems of ditched enclosures. Most contained enclosures with settlement-type features but only one produced direct evidence for buildings in the form of roundhouses. All the farmsteads were subject to minor redesign; two of them displayed more fundamental changes with substantial boundary alterations. Only one of the farmsteads is considered to be of anything other than low status. A system of fields, associated with the farmsteads, was present over most of the interior of the Biddenham Loop. Trackways linked the farmsteads and provided access to the floodplain and, probably, the substantial contemporary settlement at Kempston Church End. Although the precise status of the latter is uncertain, its presence is likely to have had a major influence on the inhabitants of the Biddenham Loop, providing a market for any surplus they produced. However, there is little evidence for high status goods coming out to the farmsteads in return. The farmsteads ceased to function by the early 4th century, although there is some non-intrusive survey evidence for Saxon activity on at least one of them. However, settlement within the Biddenham Loop effectively ceased as it became incorporated into Biddenham township’s open fields.